Fast food is designed to be consumed within the confines of an automobile, but not all combo meals are created equal in their ability to be cleanly wolfed down under the glow of red traffic lights. We're talking about the really messy stuff here: the sloppy gems that defy their humble wrappings and turn your favorite shirt into a Jackson Pollock painting the moment you tap the brakes. Here, we honor the long-lasting impressions that fast food's most car-unfriendly items have had on our lives and upholstery. In the "personal opinion" of our drive-thru operator, the Monterey Melt wins hands down on the messiness front, and we can't disagree. Those peppers and onions are chopped thick enough that one or two dead soldiers will assuredly end up on your lap, especially given that the ranch dressing turns these patties into beef Slip 'N Slides. That corn will not only be seasoned with butter, but also with the delightful cocktail of sweat and grime that comes off your steering wheel as you hold it. In addition, if you have the dexterity to be able to plow a row of corn while driving, why aren't you housing a bucket of Popeyes chicken instead? You might think a Taco Bell burrito would be messier, but those fillings are essentially wrapped in a flour napkin. The real shirt-destroyer is the hard taco, which shatters into a mess of Fire sauce crumbles. 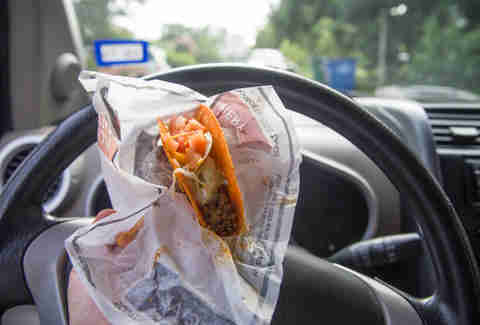 And no chip-based taco shell leaves behind more evidence of mid-commute Fourthmeal quite like the orange fingerprints of a DLT. 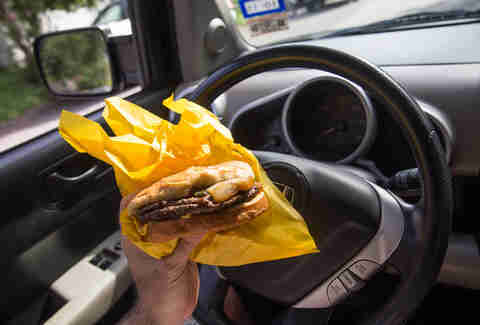 Eating a burger behind the wheel isn't on a driver's ed test, but one's mastery of the automobile is not complete until you can successfully crush a cheeseburger while switching lanes. But BK has basically made everything harder by lengthening its burger, thus the perfect handheld shape becomes more of a floppy submarine whose torpedo is barbecue sauce, and it's firing without a periscope. At your pants. Which it will hit. Even without the aid of a periscope. 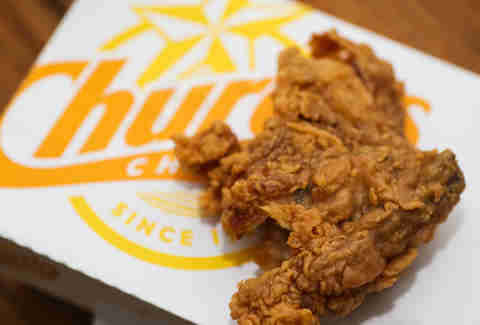 Of all the fast-food fried chicken we tested, Church's is most generous with its batter. What that means for the fried-chicken lover on the go is that it will explode into crumb shrapnel that no amount of napkins can protect against. The target demographic for Jack's late-night “Munchie Meals” is already prone to food malfunction, but the Chick-N-Tater Melt is built for landing on your lap. First piece of evidence: “ooey gooey” blend of three cheeses. Second: ranch dressing. But a third crucial weapon is that the soft croissant bun is simply not load-bearing enough to support the pair of chicken patties, let alone all that sauce. 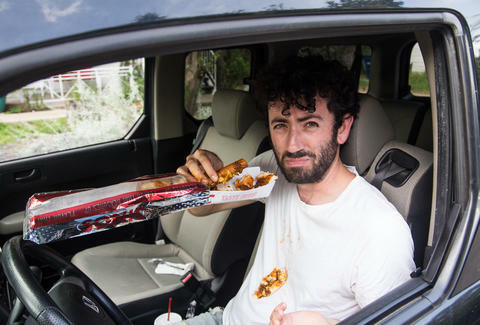 Nine inches should be the absolute maximum size of any food consumed while operating an automobile. In the immortal words of Chris Farley, this is gonna leave a mark. If you can't palm a basketball, you're in serious trouble here. The amount of nugget-based car accidents is roughly equivalent to the number of marijuana overdoses, and even Chick-fil-A's sandwiches err towards innocuously safe toppings, so the only true ticking time bomb is a cup of the hearty breast of chicken soup. Sure, Arby's signature cheddar ooze cannot be contained by a mere foil wrapper, but anyone who orders it knows what they're signing up for. This is not true for the Meat Mountain, first-time climbers of which have no idea what they've signed up for. 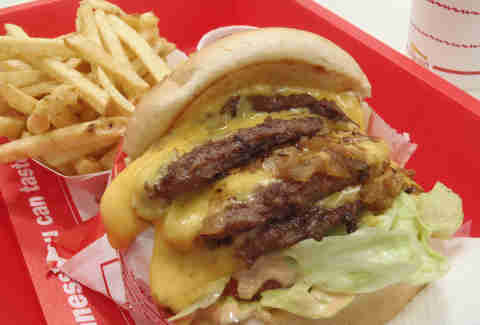 (What they've signed up for is every meat in the house, plus cheese, on a bun.) 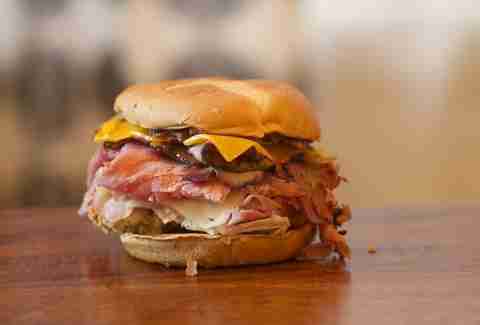 This sandwich should come with a warning not to operate heavy machinery, including a car. 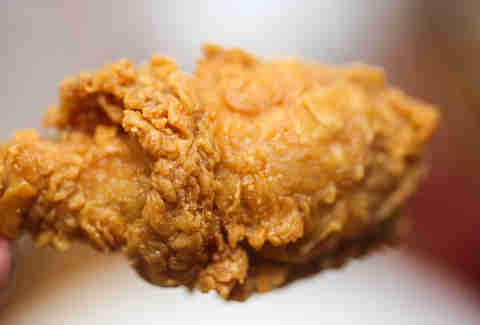 KFC's chicken is like the polar opposite of a Wet-Nap. Your steering wheel will never be the same. If you are so lucky as to have a beard, this is definitely getting in it. If you don't, be prepared to invest in either a bib or a new shirt. 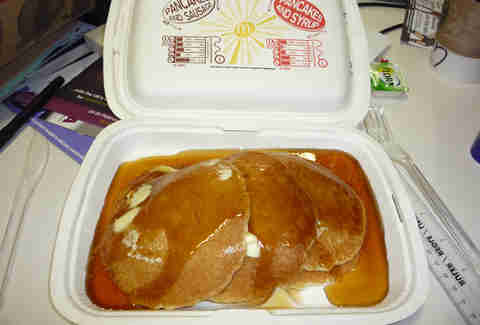 You must think very highly/lowly of yourself to try and eat syrup-drenched pancakes in a moving vehicle. The Blizzard might just be the least spillable item in the fast-food dessert canon, as evidenced by the showboating upside-down flair that every employee must truly hate performing. The upholstery-staining champion here is the banana split, which seems just soft enough to slice up with a spoon, and then all of a sudden you've got half a banana in your pants in a not-happy-to-see-you way. 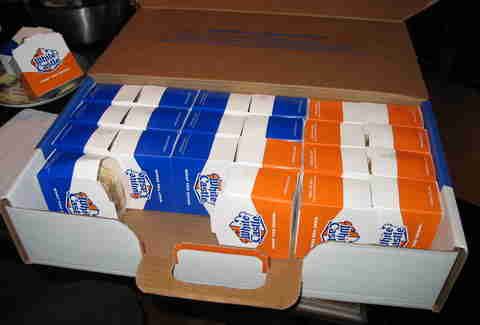 The Crave Case of 30 burgers comes in an adorable briefcase filled with enough paper waste to turn your backseat into a ball pit. A ball pit that smells like steamed onions. Which, really, is probably better than the one at Chuck E. Cheese's. You've got a better chance of successfully threading a rickety podracer through the Stone Needle in Tatooine's Beggar's Canyon than eating this chili cheese dog unscathed, and we're talking about a planet that doesn't actually exist here. Dan Gentile is a staff writer at Thrillist. He ruined one shirt in the making of this article. Follow him to accidentally bleaching all of his clothes at @Dannosphere.